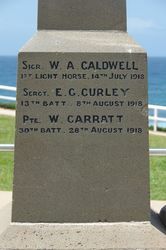 Cooks Hill Life Saving & Surf Club War Memorial commemorates club members who died in service or were killed in action during World War One. The memorial was moved in the 1930s to the corner of Bar Beach Avenue and Memorial Drive but has now been relocated near to its original site. A large crowd gathered at the entrance to the Bar Beach on Saturday afternoon, when the unveiling by the Mayoress of Newcastle, Mrs. Kilgour, of a memorial for Cook's Hill lifesavers, who had been killed at the war, took place. 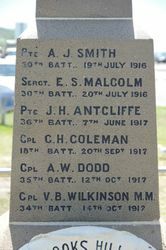 The tablet has been erected at the cost of £75, which sum was raised by the remaining members of the Cook's Hill Life Saving Club. It has been placed in a prominent position, overlooking steps which lead down to the beach. Alderman Kilgour, the Mayor of Newcastle, who presided, said that while being proud of the service he had been called upon to render, he in a sense deeply regretted the ceremony was to take place. Since the commencement of the war, however, he had learned to play many parts. They were assembled to express in some practical form their sense of gratitude and appreciation of the noble service rendered by the brave lads whose names were inscribed on the roll of honour. They were going to unveil a memorial which was to last for all time. Mr. D. Watkins, M.H.R., said that he had been informed that 90 per cent of the original members of the Cook's Hill Life Saving Club had enlisted and had gone to the front. This, he contended, was a record which should surpass that of any organisatlon, large or small, throughout the Commonwealth of Australia. Newcastle Morning Herald and Miners' Advocate (NSW), 10 June 1918. Erected By The COOKS HILL Life Saving & Surf Club.